At Amsterdam Massage Center the therapists all have their own specialty, please inform us before we start so the therapist is well aware of your preferences. All our rates are included 21% BTW (VAT), when making a booking you agree to our general conditions, including our very flexible cancellation policy. (24 hours in advance free of charge). Please come on time, inform us if you have a delay and please be flexible if you arrive too late and we cannot offer you the length of treatment that you initially booked. We always try to solve it. Most of our treatments are given with our home made organic massage oil with a nice blend of Eucalyptus, Lemon and Ceder. we have 3 single use therapy rooms for you. all treatments and amounts are available as a gift card or voucher. If you live abroad and want to send it to someone here in Amsterdam and you are not able to pick it up we can send it by mail to someone's home address. You can also pick them up in our studio. Email us your wishes. Note: not every therapists masters all techniques, please inform yourself and discuss your wishes with the therapist. ​All treatments, except the chair massage, are given with oil on skin. We have developed a very light home-made organic massage oil based on Ceder, Eucalyptus and Lemon. Designed for athletes to cut down on sport-related injuries. Will help release any built up tension and lactic acid in the overworked muscles, so that blood and oxygen can return to the muscles and effectively promote muscle repair. Sports massage seems only to (semi-) professional and amateur athletes but can actually meant to be given to anyone. People with symptoms who can not (or not anymore) go to the physio-therapist, for instance with back, neck or shoulder pain, often due to wrong posture or heavy computer use, could benefit from a sport massage. Classical or Swedish massage is characterized by its firm, yet calming pressure that improves blood circulation, eases muscule tension and improves flexibility. Basic strokes gliding, kneading, vibrations, friction and hacking are all applied in direction of the heart in order to encourage blood circulation and disposal of bodily waste. 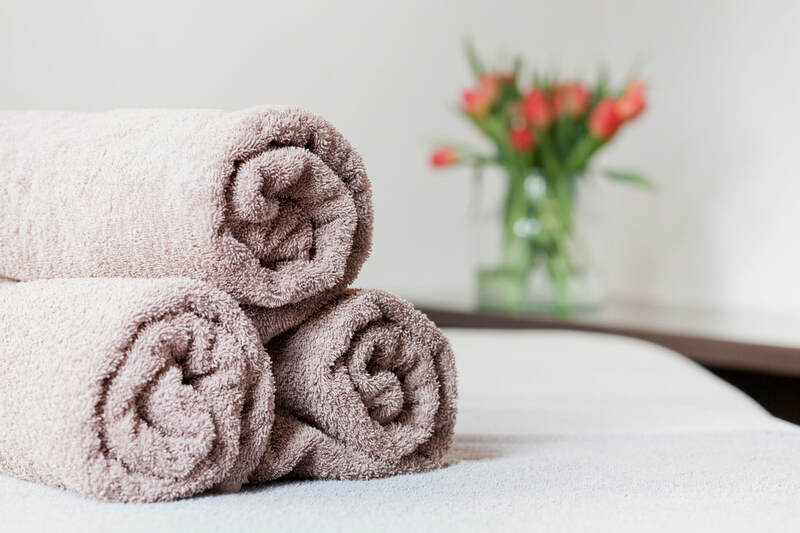 Deep tissue massage is a form of massage that focuses on the deeper layers of muscle and connective tissue of the body. It is especially helpful for chronically tensed and cramped areas, such as a stiff neck, low back pain and sore shoulders. When there is chronic muscle tension it can block the blood circulation, causing pain and limiting movement. And prevent the free flow of energy through the body. This tissue massage works by physically breaking down adhesions and stress, to relieve pain and improve normal movement. Particularly suitable for people with chronic tension, with RSI-like symptoms, who find a sportmassage to smooth and people with cellulite. Reflexology is a method for activating the healing powers of the body. There are zones of energy that run throughout the body, as well as reflex areas that corresponds to the major organs, glands, and body parts. Points on the feet, hands, and ears reflect the state of these different systems and organs. Reflexology reduces stress and promotes relaxation, improves lymph and blood circulation, helps detox the body and improves energy flow in the body. fatigue, stress, unhealthy sitting, walking or standing posture are prevented or removed. For this deep-warming massage we use hot stones that are melted into the massage. It stimulates longer muscles and helps against muscle pain. Good to detox and blood circulation is stimulated. Hotstone massage has a calming effect on body and mind and is given with our house made massage oil on skin. If the outside temperature is too warm we recommend another type of massage. Focuses on stimulating the flow of energy throughout the body to relax the muscles, relieve pain and tension and help prevent illness. Acupressure is applied along the energy (sen) lines of the body to help release blockages and improve blood circulation. Various yoga assisted stretches are made to open the joints, increase flexibility and relieve stiffness. Reflexology is also applied to the hands and feet.Over all it will bring balance and harmony to the body and aid in self-healing. During pregnancy, much changes in your body, and often there are physical complaints. A painful lower back is a common sensation for many pregnant women, while others experience sore legs, aching hips, swelling, or insomnia. Specific during pregnancy it is important to take care of yourself. This massage is possible from 12 weeks of pregnancy to childbirth. If you have medical complaints then consult your doctor first. This massage is given when you are lying in side position. Chair massage relaxes and stimulates blood circulation. We offer 20 and 30 minutes chair massage.